Here's a superb new online Slots game from Pariplay. It’s that time of year again! This festive offering from PariPlay could bring you the perfect present this Christmas. Based in Canada, Pariplay are an established but small developer who have been operating in online casino games since all the way back in 1998. Although they describe themselves as a small business, Pariplay have had their games played thousands of times across the world and offer a range of games that are free to play alongside their real money counterparts. As you would expect, the game is very festively designed. Even the pay table is decorated in sprigs of holly. On the pay table you can also see the different values of the game’s symbols. For example, Mrs Claus is worth the most in the game. If you can find her, she comes with a reward of 2500 coins for matching five versions of her. Baubles and bells are the most common symbols on the reels and therefore they’re worth the least, with a match of five rewarding you with a prize of just 125. The game has five reels and with 9 pay lines available. In your settings, you’ll also be able to set a custom value for the coin from a minimum of 0.01. The total bet per spin is then figured out by multiplying the value of the coin by the number of active pay lines. So therefore, the more active pay lines you have in play, then the more expensive each turn will be – however, that’ll also mean you have a better chance of winning! Santa Claus is, perhaps predictably, the game’s Wild symbol. This means that he can be substituted with any other basic symbol in the game in order to help you land a winning combination. Also, if you win with a pay line including Santa Claus, then your prize is automatically doubled. However, Santa Claus only appears on the first reel and is essentially worthless on his own. Besides Father Christmas, there is another special symbol in the game. If you can land three nutcrackers on an active pay line then you’ll be granted qualification to the secret bonus game. Access to the bonus game will give you the opportunity to multiply your winnings by finding the hidden multiplier coins! But there’s a snag! The coins are hidden by the nutcracker so you have to make sure you select the right one if you want to get your hand son the top prize. 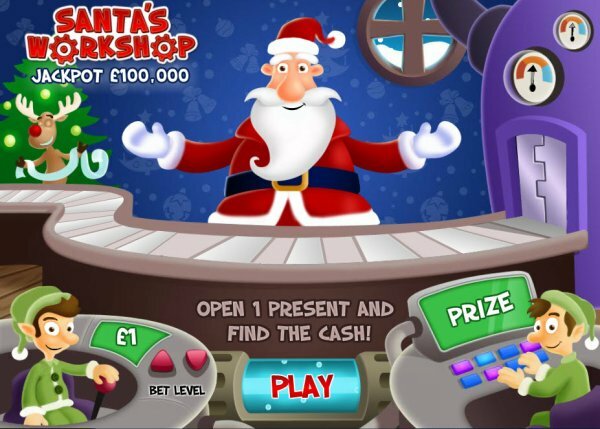 With the festive decorations adorning the screen, the opportunity to land some great presents and the inclusion of Santa Claus himself, the Santa’s Worshop online slot game is definitely the best way to get into the Christmas spirit!